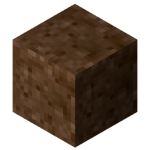 Dirt is one of the most common blocks found naturally in Minetest. It commonly found in many biomes often directly below Dirt with Grass, Dirt with Dry Grass, Dirt with Rainforest Litter or Dirt with Snow and often at the bottom of oceans or lakes. Dirt is also frequently found in the underground inside stone. When in light, it may spontaneously become a Dirt with Grass, Dirt with Dry Grass, Dirt with Rainforest Litter or Dirt with Snow block, depending on its immediate neighbors. It can be mined by a shovel, but the hand also works, but much slower. Dirt can be made to soil with a hoe.